Peter Roy’s Turkey Gumbo | and a beauty to you! By far my favorite holiday food tradition is the Turkey Gumbo that was passed onto our family from the Roy family … and maybe that is one of the reasons I love it so much. Peter is a 5th generation New Orleans-ean and this tradition comes via the Crescent city. I’m going to chat about it a little bit, but I am not going to give a recipe … you can get any Gumbo recipe and adapt it to a Turkey Gumbo. I am going to include a video on how to make a deep chocolate-brown roux, which is the secret to the depth of flavor Annie achieved this year with our Turkey Gumbo. A couple of shout-outs before I start: first to Annie for being willing to do all the work to continue our tradition this year and to neighbor and friend, Seth Kingsbury, who brined and smoked the heritage turkey which we used to make the gumbo. Okay … here’s a little riff on the whole tradition … it takes things that used to end up in the trash and turns them into a magnificent gumbo. After Thanksgiving you take as much of the breast meat as you can get off the carcass for Turkey sandwiches, and you return the carcass, breast up, into the roasting pan where I would have made the gravy. Add all the vegetable trimmings from a day’s worth of cooking, and enough water to get just below the top of the roasting pan. I usually throw in a few cloves of garlic, bay leaves, and black peppercorns, and return the pan to the oven to slow-cook all night at about 210-220 degrees – you want the liquid to just barely simmer. The next morning the house smells fantastic, and gets you in a gumbo-makin’ mood. You take the carcass and put it on a platter to let it cool down to where you can pick all the dark meat off of the bottom, and you’ll end up with a bowl full of beautiful turkey tid-bits. Strain off the turkey stock you have in the pan – you’ll use that for your stock – and throw away the vegetable trimmings. If you’re really industrious – and I used to be – after picking the carcass, return the stock and bones into a stockpot and simmer for a few more hours for an even richer turkey flavor. Then you make the chocolate-brown roux from the turkey fat and flour. This year, since we didn’t cook the turkey we didn’t have any turkey fat, so we used a high-smoke point oil (we used grape seed oil) instead. Here is a video that shows you exactly how to pull this off: Frank Brigsten demonstrating how to make a perfect roux. We used to use the low-and-slow method, but after two hours of stirring the roux was always too light for my taste – Annie used this video to perfection and calling to me from the kitchen to come see how brown it is! 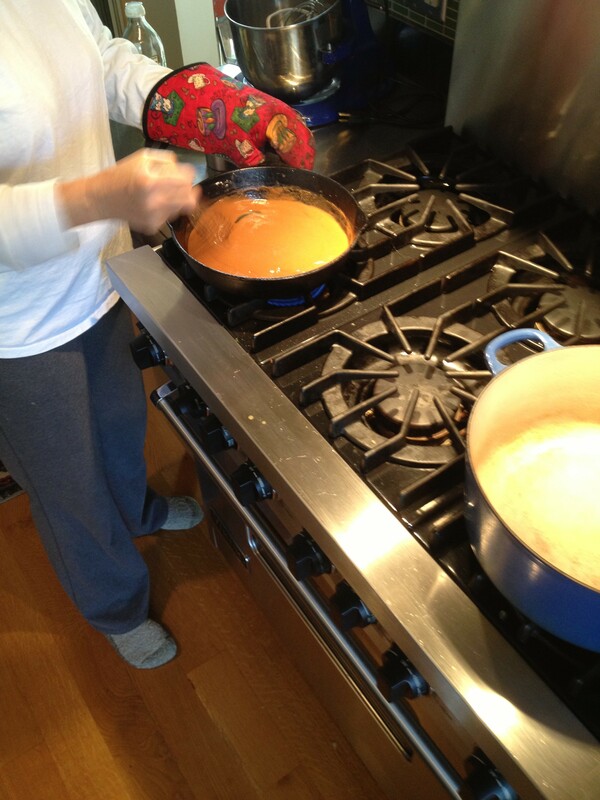 You can see from the photographs she really did get a dark roux. This entry was posted in Food by lexalexander. Bookmark the permalink. Great link for making the roux! I am loving the blog. Peter’s gumbo is really something special. I may not be from Louisiana but I make turkey gumbo every year as well. I kind of have to since we usually have so much turkey left over and hey how many sandwiches can one eat? I would l say my gumbo has a slight California twist. I don’t make a roux but I do throw in the 2 or more quarts of Nancy’s gravy we usually have left over and it does have a roux in it. The turkey stock I make with all the bone and some store bought chicken broth makes up for the lack of richness from the roux. It is so jelled that you could ice skate on it. Instead of bell pepper I use fresh jalapenos and poblanos. My only problem is that I usually end up with about 3 gallons. Anybody want a quart or two? 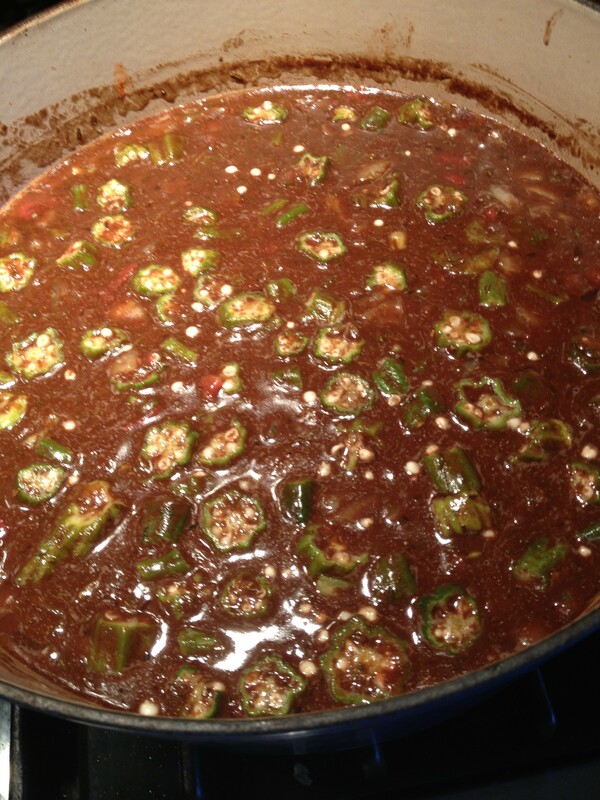 Now that looks like some good gumbo!